CALVARY COMMUNITY CHURCH would like to thank you for browsing the Bibleline Ministries Web Site. Please visit often and tell your friends! Bibleline Ministries is a ministry of Calvary Community Church that shares the Gospel of Jesus Christ around the world. 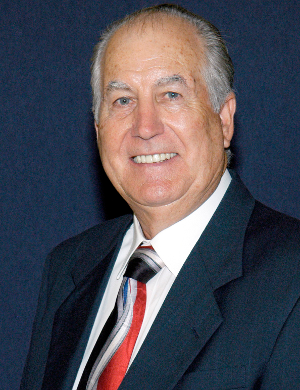 Bibleline began with Dr. Hank Lindstrom (bio) as the former Bibleline host and Pastor of Calvary Community Church. Under Dr. Lindstrom's leadership, Bibleline brought a clear Biblical message of salvation to TV, Radio, and the Internet. Upon Dr. Lindstrom's passing, the leadership of Calvary Community Church began the search for a new Pastor and was blessed with Dr. Ralph "Yankee" Arnold, a longtime friend of Dr. Lindstrom. Dr. Arnold (bio) graciously accepted the role of Bibleline radio host on September 20, 2010. Dr. Arnold, along with many volunteers and donors, are dedicated to seeing the clear message of the Gospel of Christ reach those who need the good news of Jesus Christ. We invite you to benefit from the resources available on our website and help share the Gospel of Jesus Christ. If you are unsure of how to get to Heaven, click here to find out what the Bible says.